We’d love your help. Let us know what’s wrong with this preview of May Bird and the Ever After by Jodi Lynn Anderson. May Bird must get out. Within these pages, Jodi Lynn Anderson shares with us the beginning of May Bird's daring journey into the Ever After, a haunting place where true friends -- and one terrible foe -- await her on every corner. To ask other readers questions about May Bird and the Ever After, please sign up. How does she get to Ever After in the first place? Did the water spirit pull her in? And what does this Bogey guy look like? It is tearing me apart! Natalya Kozlovski Ok. So yeah. I finished the book and found all my answers. That's all I needed. 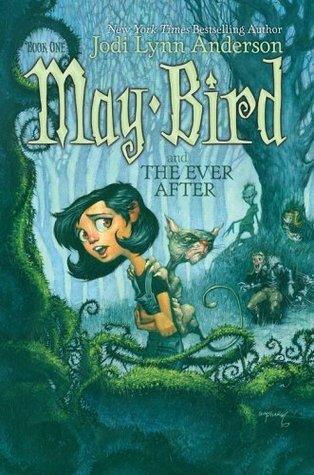 May Bird and the Ever After, the first book in the Ever After trilogy, tells the tale of a 10-year-old girl named May, her kitty named Somber Cat and the horrifying adventures they have in Ever After, the world of the dead. This was a truly fantastic tale of adventure and friendship. I've read many children's books and May Bird and the Ever After is most definitely one of the most imaginative books I have read. The author created an entirely unique and amazing world, one that was both fascinatin May Bird and the Ever After, the first book in the Ever After trilogy, tells the tale of a 10-year-old girl named May, her kitty named Somber Cat and the horrifying adventures they have in Ever After, the world of the dead. This was a truly fantastic tale of adventure and friendship. I've read many children's books and May Bird and the Ever After is most definitely one of the most imaginative books I have read. The author created an entirely unique and amazing world, one that was both fascinating and terrifying. According to Amazon this book is meant for grades 5-8 and while reading this book I kept thinking, "there is no way a little 5th grader can read this and not get scared." The book is about ghosts and other surprisingly dark and eerie beings, so I can see a kid being creeped out by the story. However, that doesn't mean I don't think it's a great book for children. It does in fact tell a wonderful tale of self discovery, personal growth and true friendship. Will some of the darker moments give a few kids nightmares - possibly, but it's still an incredible book that ends on a somewhat positive note. My favorite series as a child. I wasn't a little girl that fantasizes about ponies and rainbows, I enjoyed the dark stuff. This was perfectly dark enough for the age I was, and fulfilled my wishes of a dark, but beautiful other world. Plus, May was pretty relatable. May Bird and the Ever After is one of the greatest books I've ever read. I'll try not to let my personal bias get in the way in this review, but I just want to say that this--and the rest of the trilogy--was one of the most inspirational and impactful books I've ever read in my entire life. The general idea of the book is not entirely original (going into the afterlife), as it has been used in many other books. And the idea that the protagonist has to kill the evil leader of the world who's threatening to kill everything is also unoriginal. However, it's the way that the author executes and combines these ideas that makes this book so enjoyable. There are rarely any moments when the plot is dragging on. There is almost always something that keeps the reader at bay, wanting to keep turning the pages until Mom says that it's time for bed. However, there were some parts where the author uses some humor that, while funny, seem out of place. The characters, however, weren't entirely likable. Like mentioned a few paragraphs ago, May is like lots of other book protagonists: is disliked, practically rejected by society, and isn't really interested in making new friends. However, she is very tomboyish, and has a great imagination, always playing in the woods and pretending to be a "Warrior Princess", and collects little rocks that to anyone else are just worthless rocks. So she is likable in some aspects. Not to mention how she undergoes some character development throughout the book. Ironically, the rest of the supporting characters are more likable than May, seeing as they actually have a set personality. I love this series; it’s one of my all time favorites. It’s such a unique adventure, and I love the themes of friendship, love, and becoming. Also, Somber Kitty is just the best. Meet 10-year-old May Bird, who lives with her mother and a hairless rex cat named Somber Kitty at the edge of a woods in a place called Briery Swamp. She spends much of her time with her cat in the woods, dreaming of being a warrior princess or in her room drawing pictures of strange creatures. She's not like the other kids in her class, who think she's just plain weird. May Bird's mother, concerned and coming to her wits' end with May's "strange" behavior, is talking about sending her away to a Meet 10-year-old May Bird, who lives with her mother and a hairless rex cat named Somber Kitty at the edge of a woods in a place called Briery Swamp. She spends much of her time with her cat in the woods, dreaming of being a warrior princess or in her room drawing pictures of strange creatures. She's not like the other kids in her class, who think she's just plain weird. May Bird's mother, concerned and coming to her wits' end with May's "strange" behavior, is talking about sending her away to a boarding school in New York. Even though May Bird has reason to be scared now that she's started seeing ghosts in the woods and in her home, she's more scared of leaving her beloved West Virginia woods. Things become stranger still when, in the ruins of an old post office, she finds a mysterious letter, postmarked from 50 years ago, but addressed to May Bird at her address. The letter leads her into a world that is even further away than New York where being different--being "a live one", might just be deadly for her--a world where the Bogeyman is real; where ghosts are afraid of "people like her." It is a complex story with many layers, some humorous (ghosts of thieves playing practical jokes on one another) and some frightening (ghosts having their souls sucked into nothingness by the evil Bo Cleevil). In this strange and frightening world, May learns that, just maybe, she isn't as alone as she thought she was, and she just might find that she's more of a warrior princess than she ever dreamt. Two stars looks like an awfully disappointed assessment, but take the rating for what it represents: "It was OK."
After an Alice in Wonderland-ish tumble through a watery portal, May Bird finds herself in the Ever After, a macabre world populated by ghosts and specters (the former never lived, the latter did, or maybe vice-versa). While trying to discover a way home to her mother, May learns that the ghost world is suffering under the tyrannical fist of a particularly bad bogey whose edicts and m Two stars looks like an awfully disappointed assessment, but take the rating for what it represents: "It was OK."
After an Alice in Wonderland-ish tumble through a watery portal, May Bird finds herself in the Ever After, a macabre world populated by ghosts and specters (the former never lived, the latter did, or maybe vice-versa). While trying to discover a way home to her mother, May learns that the ghost world is suffering under the tyrannical fist of a particularly bad bogey whose edicts and monsters are slowly but surely oppressing the land. Boat, foot, and train travel by the recently departed evokes LucasArts' Grim Fandango, while the postmortem bureaucracy is reminiscent of Beetlejuice--not that the young adults at whom this book is aimed would know much of either. There are clever moments, yes, and some inspired ideas: Black water from the Dead Sea immediately transports whomever it touches to a sub-land of ghouls and demons, so rogues arm themselves with squirt guns and water balloons full of the stuff. But there is also some plot masked as frustrating dialog. For too long, May needlessly clings to the belief that her benevolent house ghost, a constantly finger-chewing Pumpkin, is a threat to her, despite him doing nothing to harm her and a few things to help her during the early stages of her journey. She also fails to ask the sorts of questions someone in her position should ask to characters who don't answer her in helpful ways. While Lewis Carrol's Caterpillar and Humpty Dumpty can get away with such obfuscation, here it feels more like a device deliberately employed to preserve a mystery or two and provide impetus for a quest. I thoroughly enjoyed this middle grade read! The world was the perfect blend of whimsical and dingy and the character were quirky amd entertaining. This was such a delightful little story and I cannot wait to read the remaining two books in this trilogy! The second Pirates of the Caribbean movie annoyed the heck out of me because it and the third should have just been one movie. Well, and I didn't realize it was going to be a cliffhanger ending. The first May Bird bok falls into the same category. Now, it didn't leave me with a tremendous headache like the second Pirates movie did, but the book didn't finish so much as it ended. It seemed like the end of a chapter, not the end of a story, and it is very possible to have great episodic books where The second Pirates of the Caribbean movie annoyed the heck out of me because it and the third should have just been one movie. Well, and I didn't realize it was going to be a cliffhanger ending. The first May Bird bok falls into the same category. Now, it didn't leave me with a tremendous headache like the second Pirates movie did, but the book didn't finish so much as it ended. It seemed like the end of a chapter, not the end of a story, and it is very possible to have great episodic books where the story arc keeps going but the plot of that book comes to a close: check out Jim Butcher's Codex Alera series fot a great example. I also felt like the book really changed tones when part II began after May arrived in the Ever After. The beginning sets up so many great conflicts, and all of them are abandoned. I suppose the beginning of the book was heading in a more light hearted, pun filled, Pictures of Hollis Woods sort of direction, and swapped it suddenly for The Nightmare Before Christmas. It wasn't that you didn't see it coming, given the cover and the prologue, but it seems sort of a lost opportunity. What May Bird is is pleasantly imaginative and filled with great twists of phrase or jokes that aren't explained but left there like little humor landmines. The Ever After is an interesting, carefully non-partisan after life filled with all sorts of Tim Burton dangers for a Live One to run in to. Anderson is good about providing Pixar type jokes that work on both a kid's and a (childish) adult's level. For instance May finds a book called, What to Expect When You're Expecting to be Executed... come on, comedy gold! This book has been on my to-read list for so long that I've forgotten why it was there, but that's alright: it turned out to be charmingly creepy, and not nearly as juvenile as I'd expected. In a lot of ways, this is similar to Catherine Valente's The Girl Who Circumnavigated Fairyland in a Ship of Her Own Making, in that both are stories about young girls sucked into dangerous magical realms. May Bird finds herself in the afterlife, which has its own complicated social structure and politics, b This book has been on my to-read list for so long that I've forgotten why it was there, but that's alright: it turned out to be charmingly creepy, and not nearly as juvenile as I'd expected. In a lot of ways, this is similar to Catherine Valente's The Girl Who Circumnavigated Fairyland in a Ship of Her Own Making, in that both are stories about young girls sucked into dangerous magical realms. May Bird finds herself in the afterlife, which has its own complicated social structure and politics, but all she wants is to get back home. There's an interesting thing going on here with the way Anderson shows her as alienated on Earth (from everyone, including her mother) and her slow building of bonds with other characters in the Other After. In the way of many tales set at this point in a character's life, the plot seems to be partly a way to address and overcome May's insecurities. The book's biggest flaw is its pacing. It takes quite a while for May to actually wind up in the Ever After, and once she's there she makes a choice that the plot... basically can't allow her to succeed in. While the climax of the book still has plenty of tension to its name, the journey to reach it was somewhat frustrating, as the outcome is basically a given in light of other plot elements. That's... very vague, but the takeaway is that the middle of this book dragged quite a lot. Obligatory cat mention - the cat in this book is excellent, and honestly the tensest part of the narrative for me was waiting for May and Somber Kitty's reunion. When it happened, it was not only properly emotional, but also a very tidy use of a Chekov's Gun, so great by several different qualifications. After getting a request for this book from a kid who has proven to have excellent taste (she's a regular at the library, and we've done a lot of book talking! ), I finally picked up May Bird and the Ever After by Jodi Lynn Anderson. I was kind of impressed with the book. May is a friendless 10-year-old girl who has a vivid imagination...and the threat of being sent to boarding school looming over her shoulder. One day while walking in the woods near her home, she falls into a lake and is sucked i After getting a request for this book from a kid who has proven to have excellent taste (she's a regular at the library, and we've done a lot of book talking! ), I finally picked up May Bird and the Ever After by Jodi Lynn Anderson. I was kind of impressed with the book. May is a friendless 10-year-old girl who has a vivid imagination...and the threat of being sent to boarding school looming over her shoulder. One day while walking in the woods near her home, she falls into a lake and is sucked into the "Ever After," home of ghosts, specters, and ghouls. May finds herself instantly hunted by Bo Clevil, who has outlawed the living from remaining in the Ever After. Teamed up with Pumpkin (the ghost who has haunted May's house for years) and trailed by May's pet Somber Kitty, the two set out to find the Book of the Dead, which will hopefully tell May how she can return home. It's a really good book i loved it. The writing is excellent, and there are many good characters. I just don't like ghost stories. All the Halloween-style world building was not to my taste, but I think other people would enjoy that kind of setting. The st In this book May Bird is whisked off to the land of the dead, called Ever After, and adventures her way across the land, searching for a way home. She makes some ghostly friends, and some enemies, in her quest to find the Book of the Dead which holds the answers to every question. I was excited to find a book that I was able to enjoy with my daughter. We read a couple chapters every night and quickly went on to finish "May Bird Among the Stars". Can't wait for the last one to be in paperback. A young outsider, May Bird is dragged into the underworld- no place for mortals, but with the help of her hairless cat, somber kitty, and an unexpected friend, can she get back home? I can't recall how many times I've read this book by now. It's always been a childhood favorite of mine ever since I picked it up in 2006 at a scholastic book fair. The imagination that went into creating a world that was macabre but also whimsical at the same time is phenomenal. With every read, I notice something different whether it be a layer to a character relationship or the story's plot itself. With loveable characters and a world I'de love to dive into myself (pun FULLY intended), I'll gla I can't recall how many times I've read this book by now. It's always been a childhood favorite of mine ever since I picked it up in 2006 at a scholastic book fair. The imagination that went into creating a world that was macabre but also whimsical at the same time is phenomenal. I came across this on Wattpad after scouring the site for some stories to add to my library, and it's impossible how fast I was hooked to this story. Not many children's stories pique my interest for obvious, age-related reasons, but this just captured me. A new twist on the old things we grew up with: life after death, pre-adolescent loneliness, the Bo(o)gey Man, and cats that are just as loyal as dogs. I've purchased the other two to read, and after finishing them, I am donating them to my libr I came across this on Wattpad after scouring the site for some stories to add to my library, and it's impossible how fast I was hooked to this story. Not many children's stories pique my interest for obvious, age-related reasons, but this just captured me. A new twist on the old things we grew up with: life after death, pre-adolescent loneliness, the Bo(o)gey Man, and cats that are just as loyal as dogs. I've purchased the other two to read, and after finishing them, I am donating them to my library for their kids' section, because this series needs to be on shelves of every library and kid's bedroom! I found the book May Bird and the Ever After to be an excellent read. The best part about the writing was the surprises. You expected the book to go one direction and then it shifted. For example, the ghost named Pumpkin that was haunting May ended up being her friend. I liked the writing style of the author and how she went into great detail when describing the characters and situations they got themselves into which made it feel like you were in the story and could imagine the scene. I didn't I found the book May Bird and the Ever After to be an excellent read. The best part about the writing was the surprises. You expected the book to go one direction and then it shifted. For example, the ghost named Pumpkin that was haunting May ended up being her friend. I liked the writing style of the author and how she went into great detail when describing the characters and situations they got themselves into which made it feel like you were in the story and could imagine the scene. I didn't see any weaknesses in the book or the writing. I would recommend for kids from fifth to tenth grade. A charming book that makes me think of Coraline done with a Harry Potter-esque tone. There were moments of genuine humor in the colorful world-building, and May is a very likeable protagonist who battles her own insecurities just as much as she tries to escape ghouls and other similar nasties. There were times when my interest waned, but once Beatrice and Fabbio appeared on the scene, I found myself more engaged. The book didn't necessarily blow me away, but it was a fun read and I definitely wa A charming book that makes me think of Coraline done with a Harry Potter-esque tone. There were moments of genuine humor in the colorful world-building, and May is a very likeable protagonist who battles her own insecurities just as much as she tries to escape ghouls and other similar nasties. There were times when my interest waned, but once Beatrice and Fabbio appeared on the scene, I found myself more engaged. Really enjoyable book. so much so that I read it in a single session and am now looking forward to #2 in the series. Reminded me a little bit of Catherynne M. Valente's Fairyland series (the girl who...). May is a great character but is almost overshadowed by Somber Kitty - a Helluva character. Highly recommended to all readers especially middle school readers - I figure there are a lot of girls (and boys too) who can relate to May Bird. I read this book so many times on sick days and vacations as a kid. I looked up to May Bird for her bravery, and I fell in love for the vividness and quirkiness of the Ever After. Now that I’m an adult I still love this story and recommend it to anyone who loves strange,wonderful, and heartwarming adventures. This book (and the whole series) is perfect for those shy young girls who are having trouble finding their place in the world. May Bird proves that it’s okay to be your quirky, quiet self. You are still important, and you are still loved. I’m entering my late 20s and I will always adore reading this series. Like 2 1/2 stars. May is likable, and her growth and spunkiness near the end are the best part of the book. The weird world is too unexplained and random for me, as is the plot. We zip from place to place encountering creative ghosts, but never have a clear idea of exactly what May is accomplishing or how. The cat subplot was funny. The Lady of North Farm had asked us to send you this map to Briery Swamp Lake, just in case. She thought you might be having trouble finding it on your own, and she is expecting you to be prompt. We are very sorry for the danger you will endure, but we eagerly await your arrival should you survive it, as we are in great need of your help. The Lady joins me in sending you good luck and best wishes.